I never fail to enjoy your posts. This one on the “Asian Squat” reminded me so much of one of the biggest things that had me stymied on my trip to Indonesia. I think I should have practiced before I had headed over there. Thanks for some enjoyable reading. Thanks for the kind words, Dee. Maybe there should be instructions on the bathroom stall doors. Thanks, Janet. I’m sure you have some great stories to tell coming from your experiences—East to West. Awesome post & very informative video!!! – Mind if I reblog it?? Thanks for asking. Yes, you can reblog this post. And thanks for the info on Hong Kong. It reminds me of how in Taiwan I would watch and watch, and just when I thought I’d figured out how to fit in, I would stand out all the more. BTW, I’ve enjoyed reading your blog. Jia you. Oops. Forgot about the Cantonese thing. See what I mean about trying to fit in? I almost died when I first saw the ‘squatty potty’. I was eight and was visiting Pakistan for the first time. Wonderful childhood memories. Sort of. One thing about squatty potties, you have to get over your first impressions. You often don’t have much of a choice. Thanks for sharing your memories. Hope you’ve had enough time in India to hone our skills. Practice makes perfect. Thanks for stopping by and commenting. « Can Grief and Joy Coexist? 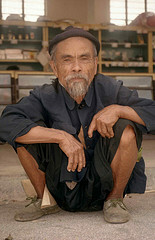 You are currently reading The Asian Squat for the West of the World at Clearing Customs.